How could one photographer make two good looking people look so bad? The first pic is a loser. My 2 most favourite people. They never look bad, maybe a little tired, but never looking bad. I hope they both had a restful, wonderful Christmas/New Years break. They look gorgeous! 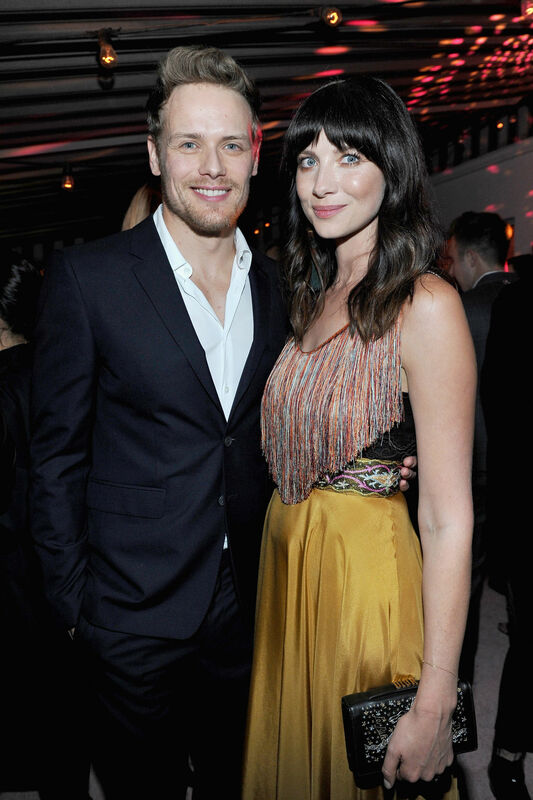 Caitriona can make any outfit look great and Sam is handsome always. I am so looking forward to watching the Golden Globe Awards – to be there cheering for Caitriona Balfe. I am very disappointed though that Sam Heughan and “Outlander” were not recognized for awards. Sam also deserves to be recognized for his brilliant acting. So, Caitriona – congratulations for the Golden Globe that will be in your hands. If anyone deserves to win the Golden Globe Award it is certainly Caitriona Balfe. She is an extremely good and powerful actress. I’m keeping my fingers crossed for Caitriona.